Check out our options and products. Support your customers. Always. Globally. Priza service cloud platform enables faster, organized, interactive service and support for your customers. Whether you provide support to customers within or outside your organization, service seekers and service providers communicate transparently and easily on-line. This is the best way to keep your customers happy, loyal and recommending. Priza business cloud platform brings a wide portfolio of cloud line of business applications which give our customers flexible, collaborative, on-line and shared environment to drive their businesses. Our cloud solutions are based on the Sys-Genitor platform which enables you to adjusted quickly, easily and execute your business workflow and processes. Different users are permitted to view different part of the business application and thus enabling management both control and sharing of business information. The management of leads, price quotations, purchase orders, bills, invoices, receipts, suppliers, customers, cashflow is part of our business applications and the Sys-Genitor platform enables the creation of any specific business management you need. Manage team tasks. On-line. Collaborative. 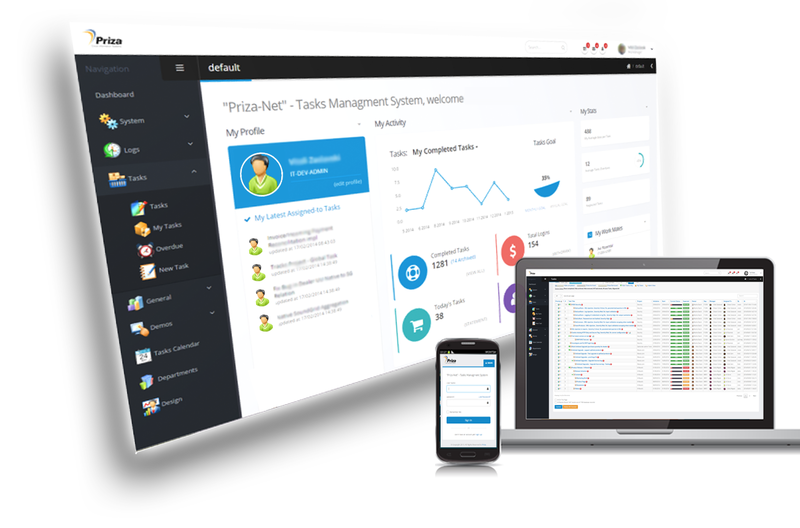 Priza tasks management cloud platform enables organizations to easily manage, control and track on-line team and personal tasks. Our task management solution helps its users remember all tasks assigned to, initiated by or managed by a user, all with initiation date, due date and completed date. Tasks are built in a tree structure so each task can have its sub tasks while each user sees the tasks he is permitted to besides his own. Manage your HR on-line. Recruit. Sort. Interact. 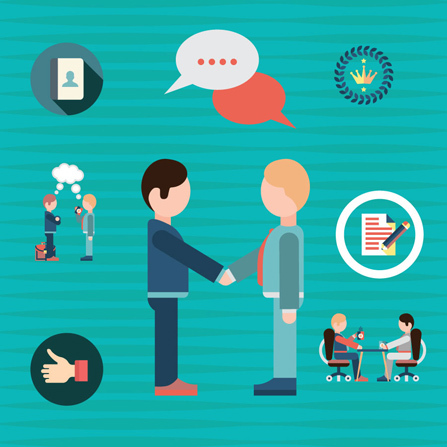 Priza human resources cloud platform enables your organization recruit your potential human resource. Candidates are able to submit their application on-line as the organization's HR managers manage and control the recruitment interactions and choose the most suitable. The system holds a file for each employee with all the relevant information accessible to the relevant manager. Priza ERP cloud platform brings a wide portfolio of cloud line of business applications which give our customers flexible, collaborative, on-line and shared environment to drive their businesses. Our cloud solutions are based on the Sys-Genitor platform which enables you to adjusted quickly, easily and execute your business workflow and processes. Different users are permitted to view different part of the business application and thus enabling management both control and sharing of business information. The management of leads, price quotations, purchase orders, bills, invoices, receipts, suppliers, customers, cash flow is part of our business applications and the Sys-Genitor platform enables the creation of any specific business management you need. Manage your business ERP in the cloud without worrying about backups and depending on a particular computer/server. Flexibility in implementing specific business needs. Work in a centralized environment on the same database without the need for installations on computers. Flexibility in creating user groups with different access rights. Restrict access only from specific IP addresses for specific users. Use one time password (OTP) via SMS or e-mail for user identification. Add specific modules in the cloud for other departments in the organization on the same platform and share common information language according to information sharing permissions and roles. Manage customers’ files with all their details, document financial situation (turnover, open bills, debt), interactions, contacts associated with the customer. Connect with your customers by e-mail and SMS directly from the system including. Send bills, invoices and reminders via e-mail, distributing messages to groups of customers according to certain filters. Manage customers’ contacts (collection, purchasing, sales, etc.). Various indications including statuses including total business turnover with each customer. Record customer interactions for bills and for customer files with link between them (for control and monitoring). Create mailing messages from content pages. Manage organizations and contacts (customers, potential customers, suppliers and others). Create contacts groups and send them notifications / e-mails. Manage leads for potential interested customer inquiries received in various ways including via a dedicated website form. Manage the sales process from referral to interested customer. 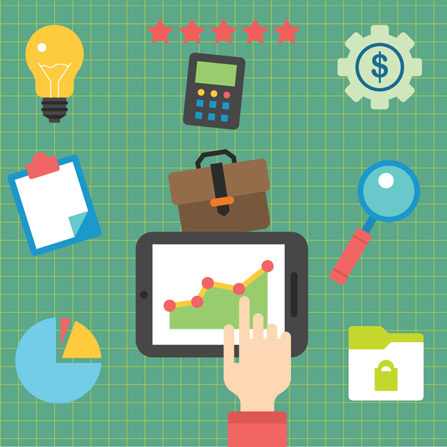 Analyze the sales process and improve. Manage quotations, duplicated existing quotation, mark printed, sent, ordered and invoiced quotations. Manage contracts with customers and control contract renewals. Produce bill directly from client’s file automatically. Record historical customer contract data. Manage different types of contracts and renewals (annual, monthly, one-time, hourly). Bills preview enables manager approve and comment on bills prior to sending them to end customers. Bulk production of bills on a monthly basis in PDF and HTML formats. Send HTML and PDF format bills via e-mail to customers’ relevant contacts. Send payments reminders with a cover letter by e-mail and overwhelmingly while showing the number of days of delay / days are left for re-payment. Bills indexation to consumer price index on a monthly or yearly basis. Record all sent e-mails to customers. Produce invoices and receipts (approved by Israel’s tax authorities). Automatically produce invoices directly from quotation or bill. Payment delays indicator for each invoice. Assess customer’s payments morality and history. Create receipt directly from invoice. Produce payments reminders to all non-paid bills. Create various types of reminders from bills and customers. Send reminders via e-mail or SMS. What’s on my plate for today – daily email to system users with their open reminders. Manage suppliers including detailed information, suppliers’ invoices and open debt. Track and manage purchase orders. Insert expenses to cash flow management. Month view of total income against total expenses including net VAT payment to authorities. 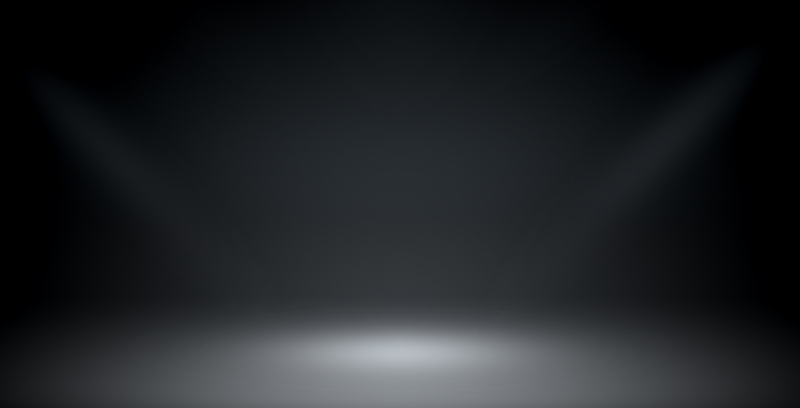 Cash flow management with future expenses vs. expenses already expended view. Associate expenses to various accounting sections. Create recurring expenses (such as rent). Detailed flow management with estimated future cash flow as well as accurate cash flow. Create income records directly from receipts and expense records directly from suppliers’ invoices / expenses. Access system modules for different users according to users’ permissions. Manage cash flow (income, expenses, VAT, revenue) monthly and gain cumulative business picture. Service cloud – manage customer service and support, service and support requests, technicians operations, help desk. 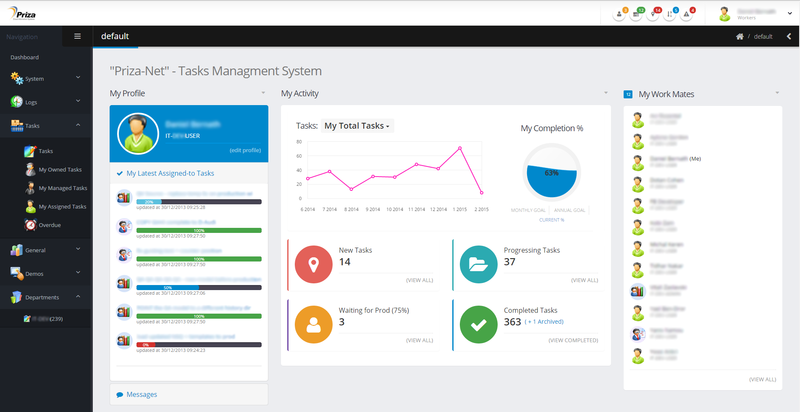 Tasks cloud - organizational task management system. Smart search engine in each module. Statistical information displayed in various areas in the system (examples - number of customers according to their statuses, number of open reminder). Record for each record who updated it and when. Up-to-date technology, ease of carrying out adjustments if necessary. Export data to MS Excel at any time. Import data from external legacy software. Cloud based CRM. flexebile. Customized to your needs. CRM with great flexebility and customization options for reasonable price. Cloud based surveys system. flexebile. Customized to your needs. 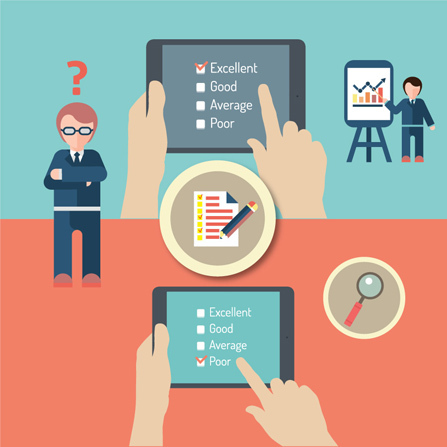 Build on-line surveys with greate Flexebility. Build cloud based information systems. flexebile. Customized to your needs. Let us Build you any cloud based information system with great flexebility and customization options for reasonable price. Priza platform is incredibly especially extremely flexible and fully customizable. Priza Sys-Genitor cloud platform enables building any cloud based information system with great flexebility and customization options for reasonable price. 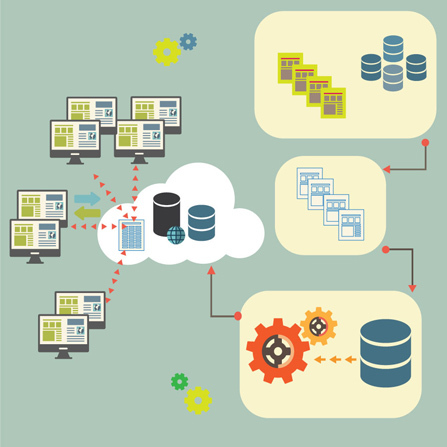 Manage and control the service and support for your customrs using Priza service cloud system. 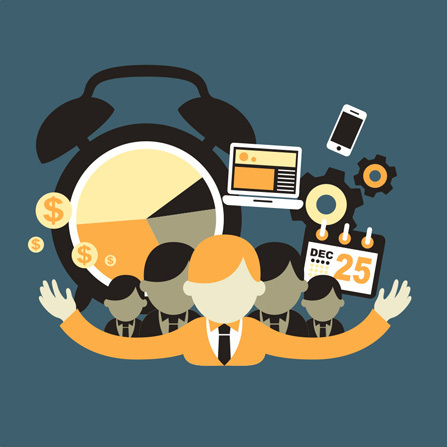 Manage and control workforce tasks in your organization using Priza shared tasks cloud system. Manage and control your organiztion business operation with Priza business cloud system. Manage and control your customers and leads with Priza CRM cloud system. Recruiting, on-line registration, filtering and placement of employees. Control and manage employees catalog and history. Create organization's on-line surveys using Priza-Net surveys system. Reduce costs and paper work, increase efficiency, enable on-line registrations, filter and sort potential applicants and manage scholarships operations by using Priza scholarship cloud. Manage and control your organiztion's operations from top to bottom using Priza Sys-Genitor platform. Manage and control your K12's operations using Priza Sys-Genitor platform. Over 12,000 users use Priza cloud platform. Meet our customers. Tal Kidan, the technological and innovative founder of the company, is in charge of Priza's unique cloud information systems platform, the SysGenitor, as well as responsible for the management of Priza's platform based applications development projects. Tal holds M.Sc. in physics from the Technion - Israel's Institute of Technology as well as M.B.A. from Haifa University with specialization in information systems. 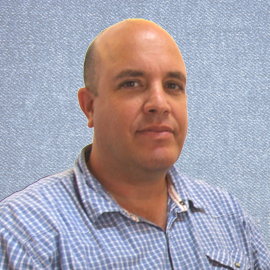 Tal brings with him many years of innovation and experience in information systems and cloud information technology. Sharon Holzer serves as director of web based projects at Priza with many years of deep experience in database and cloud based applications. Sharon holds B.Sc. in Computer Engineering from The College of Management and B.A. in economy and management from Tel-Aviv University. 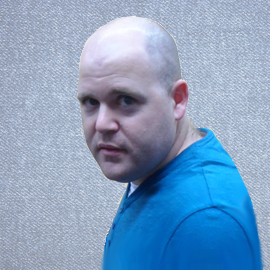 Sharon brings with him experience and knowledge in cloud systems development. Hila Shrem serves as Director of cloud information systems projects at Priza. Hila holds B.Sc. in Computer Science and Math from Bar-Ilan University. 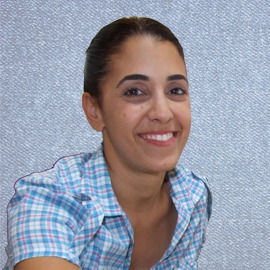 Hila brings with her experience in managing web based systems development projects. Shani Bard serves as director of cloud based application projects as well as part of the developing team of the unique cloud information systems platform, the SysGenitor. 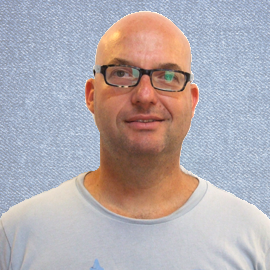 Shani has experience and deep understanding of cloud based applications development. Shani holds B.Sc. in Computer Science from Haifa University with specialization in cloud based information systems. Einat Shwartz serves as cloud information systems projects programmer at Priza. Einat holds a B.A. in Biology from Bar-Ilan University and underwent retraining to programming and information systems analysis in database development environment. 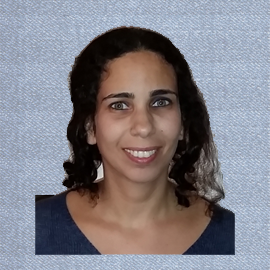 Einat is a graduate of military service at Mamram and she brings with her experience in the development of databases and cloud information systems. 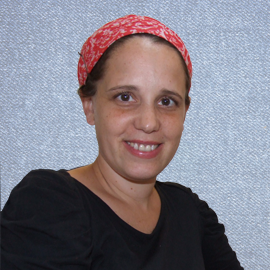 Liron Maayan serves as an administrative office manager at Priza. Liron holds a B.A. in management and M.B.A. from The Ramat-Gan College. liron brings with her experience in administrative management and uptodate cloud information systems and internet environement. Priza team will be happy to receive your message and reply as soon as possible. Priza specializes in creation and development of organizations’ cloud workspace environment. 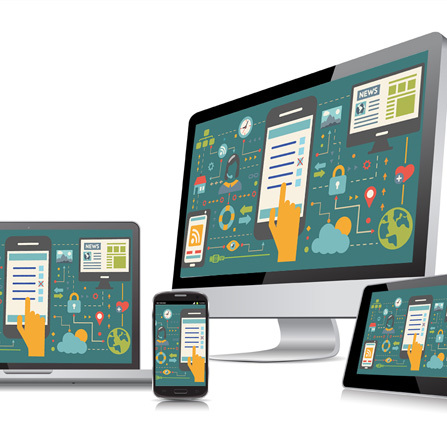 Our cloud information systems and web/mobile-based applications make our customer`s workspace environment very efficient and convenient. 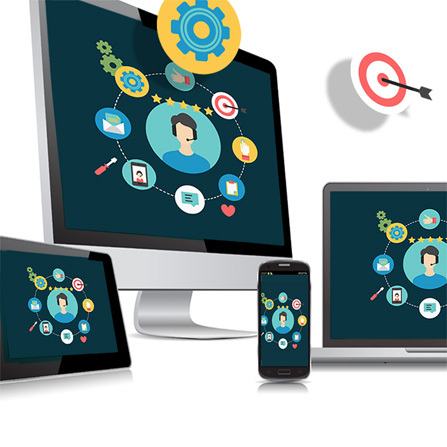 With experience of over a decade, various areas of expertise and satisfied customers, Priza has proven experience in characterization, creation, construction, maintenance and hosting of web information systems. Priza is about making our customers work in a much more efficient way using the next level of online web based / cloud information systems and cutting edge technologies, enabling them to be in the best place of today’s digital world. All this is achieved with dedication, responsibility, best service, team spirit and constant innovation which is all wrapped inside our SysGenitor - the web based information systems generator platform. Priza information systems are serving the Ministry of education, National roads company, Institute for Occupational Safety and Hygiene, Antiques Authority, philanthropy foundations and many others.